My favorite band Ted Lyons & His Cubs have been spotted two more times now (film numbers five and six!) by dustedoff (thank you for letting me know). Incidentally, this guy shows up in the same scene, dancing with Asha. I need to know who he is! Pompadour Man! I see him everywhere. Someone said once that he might be Vijay or Oscar from the choreographer duo, but I can’t find much about them either. So many questions, so few answers. Hindi film history is so murky and veiled in mystery. Sigh. Edited to update: He is in fact Oscar! One mystery solved. Posted on April 23, 2009 at 12:09 pm in Hindi film history, Hindi movies	| RSS feed You can skip to the end and leave a reply. wild! 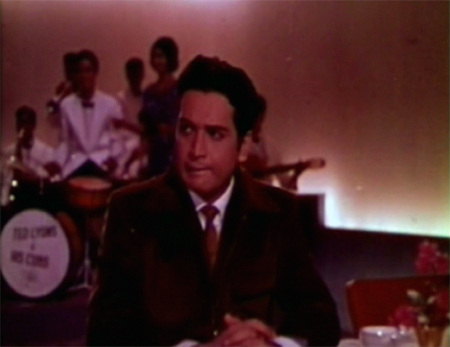 Yes, pompadour man looks like one of choreographer guys from jaane-jane and nadaan without the long sideburns! Yes exactly! But who…who is he? Who? Memsaab I know this is off-topic, but I thought you might be interested in a homemade DVD I just made called “Helen of Bollywood.” I did a lot of work restoring the poor sources I had to work with and I think any Helen fan would enjoy watching Helen in a high-quality compilation DVD. I’ll be posting it tomorrow at BWT.torrents. So, hopefully everyone can grab a copy. I just created a blog that has screenshots and info on what I did. lol a Ted Lyons DVD great. Yes, and the monkees. and Shammi in his beatle wig! and the Peter, Paul and Mary trio in the Duniya song from Dus Lakh!! You are so right. There is very little material available in these days of internet. At one time I tried and tried to get some stuff on the maverick comedian IS Johar and could not find a single thing. Only whatever I remembered reading about him when I was younger. At one time he was married to a girl I knew – Minna. I tried to dig out info about them.. n … blank. Indian film industry needs some serious updates on its golden era. There is stuff I remember from listening to interviews and shows on the Radio, but nothing on internet ! Anyway, it’s difficult for my untrained ears to answer that question, especially if I’m considering the Ted Lyons version. :) But this is a goood song, as is the similar song from Aashiq. In fact, you’ve managed to get me hooked on to Ted Lyons and His Cubs too – I find myself looking out for them every time there’s a club song in a film from the late 60’s. Am looking forward to your review of Mere Sanam! They are usually surrounded by very crazy-cool dancers and hangers-on…that’s what I love so about them! But no idea if it’s got subtitles or not (probably not), and I’m not sure they deliver outside of India. It’s out of stock there and also at Induna :-( And pretty sure no subs since it’s only on a VCD, but I’d struggle through it anyway. Next time I come to Delhi I will make you show it to me and translate as we go! Ha! O God, you have sharp eyes! I watched that song from Raat aur Din and thanks to you I knew about Ted Lyons and co, but just didn’t notice them. Got to go and see my doctor again! I got interested in this mystery, and did some research. It seems that Oscar Unger (full name) was in the navy. The dancer could be him, because he was a trained dancer, and now runs a school called Tomy House, as well as belongs to an association of Dancers. Vijay was also from the navy, but not much about him anywhere. imdb gives a list of films choreographed by the two. The last two paragraphs here talk about oscar-vijay. I’m sure there’s a lot more out there. At least now we know Dev anand gave him his first break. I did actually figure out that he is in fact Oscar when I saw him (and he was credited in the cast) in Bombay to Goa. Those are great links, I had not seen two of them :) The search for the others continues!!! LOL! It seems that its not just the actors who carry on their parent’s tradition of acting but choreographers too. Is this a Ted Lyons sighting also ? I could not make out but I think it could be. 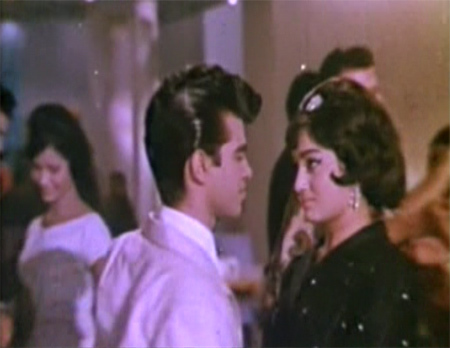 The movie is Yeh Zindagi Kitni Haseen Hai (1966). I think he might be the saxophonist on the far left of the band? He is all over the place in 60s films, one reason I became curious about him to begin with :) From the name on the drum, the band is called “Del” something though, not Ted & Co.
All my family are were in the Industry and My Aunty at the time was a up and coming Choreographer… She worked alot with a very famous dancer called Helen and all the well known artist in the 50’s and 60’s.. I would love to hear back from you.. this is very exciting and Dad was so happy that he saw this website…. So happy to hear from you :) Have sent you an email. Cheers! Oh, brilliant! Steve, think your Dad and his band really added Fizz to the 60s films! Thanks for bringing me back my memories,I worked in Bollywood industry for 22 years,& yet when I hear the music of the old films I want to get up & dance. Thanks once again everybody that has comented. Thank YOU for everything you brought to the industry over the years :) I’ll bet you can still dance too! I am so excited to find this site and hear from Ted! “Jaan Pehchaan Ho” changed my life. It is a work of genius. I have started a Ted Lyons fanpage on Facebook–please join, everybody! Well in the movie I am dancing with a girl in a green dress her name is Pamela,all the instruments that are being used are mine which I hired to studios for musicians. Well in the movie I am dancing with a girl in a green dress her name is Pamela. But I regret his photo is not pasted. It would be nice if somebody did this. I have known Ted since 1962. My father had a dance Hall called Suman Dance Hall later changed to Ramesh Dance Hall, at Dadar Mumbai. Here, I have seen many Bollywood dancers, and got to see Ted Lyons right upto 1972 his last years in film business. Hi Willie glad to know you are around,yes it was fun at Ramesh dance hall where we used to do our rehearsals for all the movies,& your dad also was an actor in the earlier years. Hi Willie, glad to know you are around,yes it was fun at Ramesh dance hall where we used to do our rehearsals for all the movies,& your dad also was an actor in the earlier years.